Flavio Ikoma is a Brazilian designer of Presidente Prudente, a city in the State of Sao Paulo, who since childhood has always had a passion for knives. To realize his passion he studied mechanics to learn the basics of metallurgy. Since his debut in the Brazilian market in 1993 Flavio Ikoma counts amongst his famous inventions the IKBSTM system (designed in collaboration with the guys at Korth Cutlery), knives from successful designs such as the Fossil, and this latest development: the system - patent pending - ILSTM (Ikoma Locking System), that will be explained later. This list must obviously include the No Time Off, a sturdy EDC knife created with the sole purpose of working. 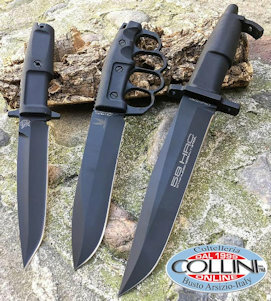 From its name it is clearly evident the intention was of making a work knife for everyday use, always ready in case of need and strong enough to guarantee its versatility. The wide blade with original drop point design and hollow grind has a length of 75 mm and a thickness of 3.8 mm on ricasso. On the spine of the blade a large swedge has been made that begins over 1 cm from the tip, thus preserving its robustness, and several jimpings for the advanced grip. Other jimpings have been worked on the finger choil (slightly beveled to avoid injury), on the flipper, on the spacer and on the spring of the locking mechanism. The blade is made of CTS BD1 stainless steel (comparable to GIN-1 Hitachi steel) hardened to 57-59 HRC; it is a new material for the CRKT. This alloy, produced by Carpenter and used for the first time by CRKT, has a high carbon content, hardenable high hardness and, in knife application, confers a good edge retention and good wear resistance, maintaining ease of sharpening. The flipper blade opening is very fast and smooth, thanks to IKBSTM technology (Ikoma Korth Bearing System) further facilitated by the blade heaviness. This system differs from the ordinary ball bearings, because the spheres are not placed in a holder, but instead are simply placed in a suitable recess formed directly in the liner around the main pivot. This system, in addition to a reduction in production costs compared to other similar systems, results in less need for maintenance, rigidity of the system without blade plays, strength, high durability and - of course - a fast and fluid opening of the blade. In contrast we may note that in the case of knife disassembly for cleaning or maintenance, the repositioning of individual spheres is quite troubled (we suggest the use of a little bit of grease, to limit the balls mobility). We come now to the main innovation introduced this year and with patents pending: the Ikoma Lock Safety (ILSTM) mechanism. The No Time Off is in fact the first CRKT's knife equipped with this new system for additional safety, in combination with the liner-lock. Essentially it consists of a steel spring that is automatically placed between the liner spring and the scale, thus not allowing the blade to accidentally unlock if the handle has been gripped with extreme force (which on some rare occasions could happen with a liner-lock which has not been properly designed). Moreover with this system it is no longer necessary to protrude the spring of the liner to form the handle scale profile, or create a recess in the opposite scale, to facilitate blade closure. The ILSTM will require a bit of practice to get used to the change of direction with which to approach the liner-lock, but after a short time you can appreciate the ingenuity - even in its simplicity - of the system. The handle from the pleasant waffle-iron pattern, is realized with black colored fiber glass-reinforced nylon scales, of a thickness equal to 3.2 mm, two sturdy liners (approximately 1.6 mm thick) made in 420J2 steel, and a large spacer to accommodate a blade of generous size. The coupling of all knife parts are made to perfection, as always when it comes to the products made by CRKT. You would think that as EDC this knife is rather bulky and heavy (about 167 grams), but of course - as always - there is the compromise between robustness and compactness; it is also obvious there are differences in perception with different types of clothing that will be worn(clearly with lightweight garments the feeling of volume and weight will be greater). The No Time Off is equipped with a deep carry pocket clip in tip-down configuration, very well designed and placed into the recess formed on the scale, so it protrudes in vertically in respect to the profile of the handle itself and it has no impact on the grip. 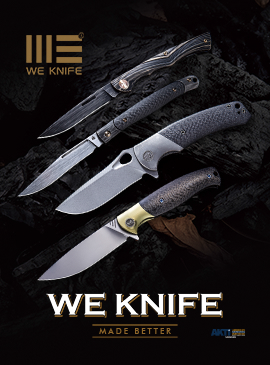 The retail price indicated on CRKT's official website is $ 125.00 with the option to choose the version with combo blade. As usual, we conducted qualitative cutting tests on various materials (paper, corrugated cardboard, mooring ropes of various diameters and car safety belts). The factory edge sharpening is excellent but the edge retention has not proved to be optimal as after the first cutting sequences we felt the need to re-sharpen the cutting edge. At the end of the test the knife was easily sharpened in a few minutes and was again ready to efficiently return to work. The tip is very strong as you can imagine just looking at its conformation. It was tested stabbing the wood and prying on the tip knife; clearly given the large radius of curvature of the blade towards the tip, penetration is reduced, but it is enough to be able to accomplish most of the tasks. Altogether this EDC work knife is rather wide and heavy, but allows a very comfortable grip (also in advanced grip for fine works), meets the perception of safety in use and a general robustness of the instrument which are the basic requirements for hard work. Per quanto sia piuttosto difficile sbloccare accidentalmente un liner-lock, un sistema di sicura aggiuntivo è sempre gradito – soprattutto negli strumenti da lavoro - ed il nuovo sistema ILSTM consente di sbloccare la lama con una mano in modo semplice ed intuitivo, senza limitare la fruibilità del coltello. Il No Time Off è, per design e tecnologie impiegate, un EDC da lavoro funzionale ed originale allo stesso tempo. Although it is rather difficult to accidentally unlock a liner-lock, an additional safe system is always welcome - especially in work tools - and with the new ILSTM it is possible to unlock the blade with one hand in a simple and intuitive way, without restricting the usability of the knife. So the CRKT's No Time Off is, for both design and technologies used, an EDC work knife, functional and original at the same time.